Repress incoming! A blast from the past... One of the most iconic tracks from the Noir Music back-catalogue makes a remixed revival. 3 impressive remixes to spice up your DJ sets. 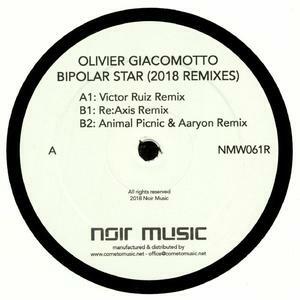 Victor Ruiz makes Bipolar Star a fantastic big room techno stomper with his signature sound and just the right amount of melody from the original to make it recognizable. Re:Axis almost makes the track unrecognicable with a more minimal techno approach. Something I am sure will please the forefront of the underground techno scene. Animal Picnic & Aaryon almost pays tribute to the original with their very cool update keeping a lot of the original feel but cleverly tweaked the elements to sound super fresh again. I believe there’s a little something for everyone in this remix package which was the purpose behind doing it instead of a bunch of remixes sounding the same. I hope you like the new remixes and put “Bipolar Star” right back into rotation.